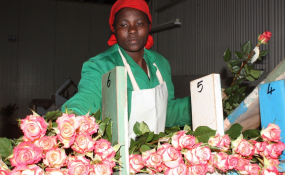 Kenya exports flowers all over the world (file photo). Gaborone, Botswana — Kenya and Botswana will work closely through their respective business people to encourage trade between the two countries which currently is way below potential, the Chief Cabinet Secretary at the Ministry of Foreign Affairs and International Trade Ababu Namwamba has said. Speaking when he presided over the 2nd Kenya-Botswana Diaspora Investment Forum at Fairgrounds Holdings, Gaborone, Namwamba said Kenya and Botswana had cordial relations at the political front that must be replicated in a robust business-to-business relationship. "We have agreed with the Minister for Investment, Trade and Industry Madam Bogolo Joy Kenewendo to revisit a 2016 Memorandum of Understanding that clearly stipulates how our two countries can trade better and increase the volumes which as we speak remain way below the actual potential," Namwamba told the forum. Namwamba called on the Kenya Diaspora in Botswana to lead the way in these investments. "In the words of JF Kennedy, ask not what your country can do for you. Ask instead what you can do for your country. Please be good ambassadors for Kenya", he implored. He further urged them to exploit opportunities presented by government focus on the Big 4 sectors of food security, affordable housing, universal healthcare and manufacturing. Namwamba also invited both Kenyans and Batswana investors to strongly engage in both the Botswana Global Expo of October 31s to November 2nd and Kenya's International Blue Economy Conference slated for November 26-28 in Nairobi. "More than the economic capital you provide through remittance, you possess a wealth of experience and know-how in many disciplines that would be of great beneficial back home and even your current host country," he said. He said the government was working to harness the collective collateral of the Diaspora business contacts, networks, opportunities, successful ventures, influence and power developed over time to leverage Kenya's position and interests in the globe. He said efforts by the government to engage the Diaspora has borne good result exemplified by the growing Diaspora remittance which is currently estimated at Sh222 billion; the largest foreign exchange earner ahead of Tourism and horticulture. It is estimated that if this trend continues, remittances could increase from Sh195 billion in 2017 to Sh250 billion in 2018, an increase of 25 per cent, accounting for 3.7pc of the GDP. Namwamba further assured the Kenya Diaspora and all potential investors that Kenya was a strong trajectory of political stability with all key economic and social fundamentals looking upwards.